Ryan Howard and David Letterman, enjoying each other's company. 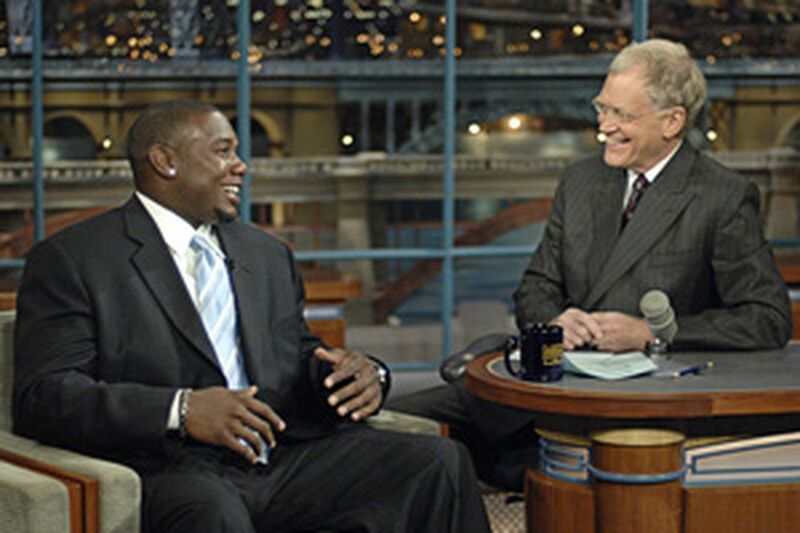 It wasn't hard to score Ryan Howard's appearance on the the "Late Show with David Letterman'' last night. The Phillies first baseman hit a grand slam. Howard, while obviously more at home on the baseball diamond, more than held his own. Time after time, Letterman lobbed softball questions that the Phillies star hit out of the park to the delight and laughter of the audience. In one lighthearted exchange, Letterman discussed whether Ryan anticipated pitches. "You're a tremendous hitter," Letterman said. "Now help me out here: Do you know the situation, or sometimes do you guess? Tell us what the percentage is of knowing and guessing." To which Howard laughingly responded: "I would say I probably guess about 90 percent of the time." When Letterman questioned the high percentage, Ryan added: "Most of the time I'm swinging with my eyes closed anyways." Letterman also discussed the player's family and seemed intrigued that Howard's mother is involved in his financial affairs. "Your mom kind of runs the business of you, doesn't she?" Letterman asked. "She does," Howard replied. "Yes, she does." "Now, that's got to be a comforting thing, right? asked Letterman. "It is, it is," Howard said. "You know, the whole allowance thing that goes on. I've got to check in with her, you know." "So mom actually said that she gives you an allowance," Letterman said. "She did, yes she did," answered Howard. "Is it like lunch money?" asked Letterman. "It would be a lot of lunch money," said Howard. The two talked about How-ard's goals for the future (a World Series ring), which cities he least likes to visit (he likes them all) and - without naming Jimmy Rollins - a teammate's prediction that the Phillies are the team to beat.